I'm being pulled towards Pandora, but right now I'm using Musicovery.com to do similar. it's GREAT! PS- my "Evanescence" station is my usual choice on Pandora! 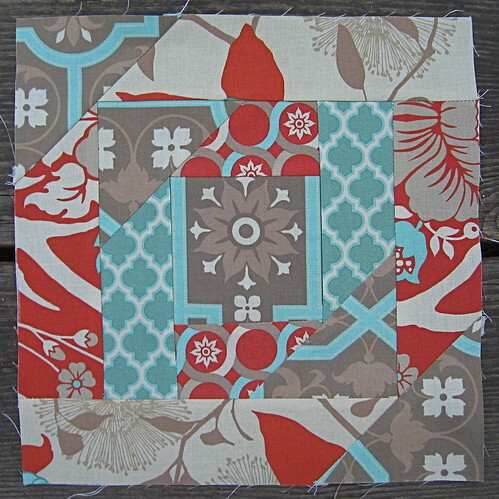 Yes, I just started on a half square triangle Deer Valley quilt! It's not on my blog yet, but it will be soon. I combined the persimmon color scheme with some pumpkin Kona. LOVE IT! I LOVE that deer valley fabric. LOVE it. I'm planning a few projects, pillows and an ottoman out of that fabric for our living room. However, I am broke at the moment so I'm praying that I will make bank at my upcoming street fairs. Hey John! I LOVE pandora too. I find myself doing the same thing with itunes. I now have a long list of songs "TO BE DOWNLOADED" on a pad next to my computer. I just mentioned your deer valley blocks in a post on my blog yesterday. This line is wonderful. I still like Chestnut Hill the best, but Deer Valley will be a big hit I'm sure. Now to work up the nerve to slice into those FQs. Thanks for the mini quilt wall links. I am in the process of converting our extra sitting room in to a quilt studio. I just joined a number of the flickr groups you mentioned and love the idea of a display wall. I finally feel good enough about my work to be able to do some sewn swaps. Looking forward to swapping with you some day! Hey John. If you want me to send you MO2 just email me. Thanks for the random thoughts. Great to see what's going on inside that head of yours! 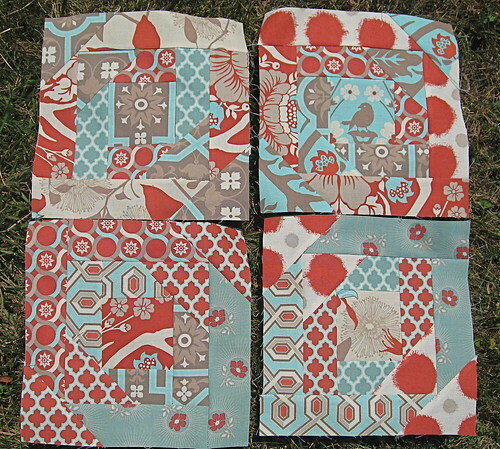 Beautiful blocks and they really show what a difference fabric choices make! 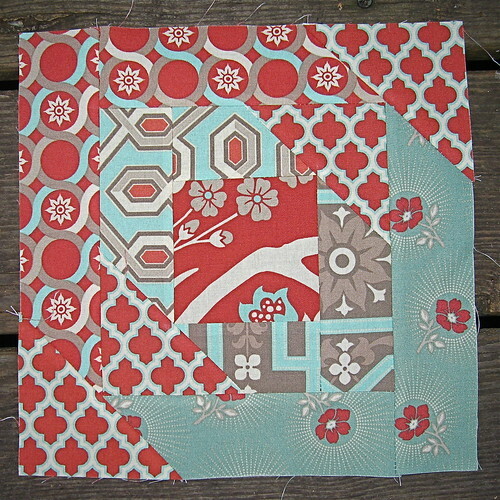 I have made a few of those pineapple blossom quilt blocks, but I always seem to not pick contrasting enough fabrics. Quitville is one of my favorite resources though! 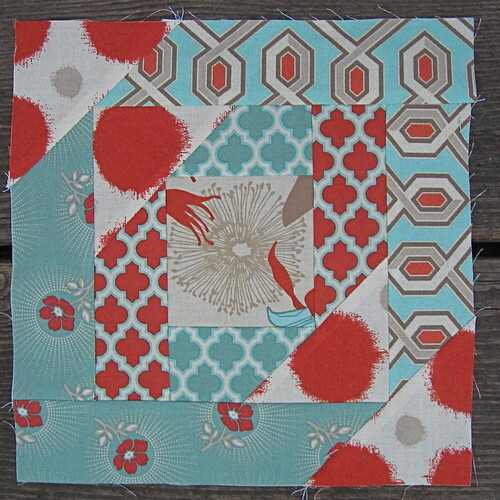 Great work, I adore the blocks and the fabric and also--thanks for the FAQ! I have been wondering what the heck you would do with all those mini quilts. John, have you tried paper-piecing? Get someone to show you how if you haven't. It is really easy to learn. But, if you have tried it and just don't like it. Well, I understand that too. Love your pineapple blocks. Wow!!! I LOVE Pandora! I'm a huge advocate...I've told everyone I know about it. I start it up in the morning and just let it play all day long. I really like your pineapple blocks! I like that they have fussy cut centers but are still interesting blocks...usually blocks that you can fussy cut are boring! I've been looking for a block pattern where I can fussy cut some large floral fabric that I have...I'll have to check this one out. Thanks for the link. That quilt is going to look REALLY awesome!!! I too have become addicted to Pandora... it's got the "Boom, Boom, POW! I love the wall quilt idea!! And I, too, think Pandora is AWESOME! Luckily (or unluckily) I don't have an ipod, so I haven't suffered financially from my Pandora addiction yet. I left a comment (long one!) back at the SMS giveaway. I was delurking a lot then and didn't know how to be sure I was leaving myself open to reply. I settled on having a Google ID with my email in the profile. Do you mean something more about being repliable?! Nice to see you back posting - I'd just got up to date with your blog when you disappeared! 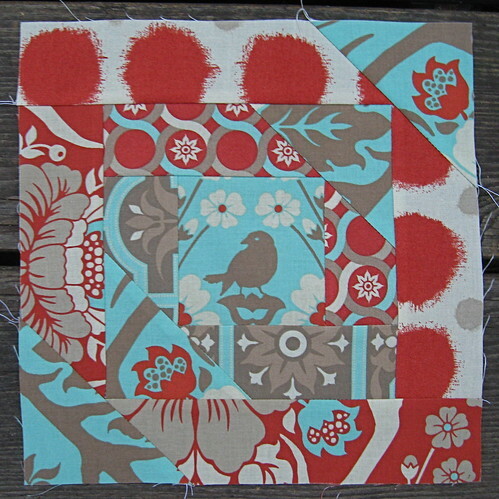 Thanks for the Pineapple block - that looks doable - I'm not keen on paper piecing either. WIP Wednesday - Even a WIP WEEK wouldn't cover me - I teeter on that line between WIP and UFO! I have no blog of my own yet, but I'm working on it!! I want to buy the Joel Dewberry Deer Valley line too. I'm a huge fan too! John, just discovered your Blog and think it is great that you quilt! They ship anywhere in the world FREE and I have used them a few times with no problems. Hi John, I hope you manage to get your hands on a copy of material obsession two. I've just caved and bought myself one. It is wonderful. I'd love to swap, but I'm with Highwaycottage, postage is very steep from NZ. However there is another way to get hold of Sarah Fielke Designs. Look for Quilts Downunder. The magazine has a free online subscription and often features the designers from Material obsession. There is a great Sarah Fielke design this month. Think of it as a sneak peek at Material Obsession 3. Did you mange to sort out a swap for Materail Obsession 2? I caved in and got one, let me know if you still need one, I can have this one in the post tomorrow (I'd just get another for me). I'm glad I got it, the patterns are gorgeous! !